Beginning August 20th (a week later this year due to a Pebble Beach golf tournament) thousands descended on the Monterey Peninsula for a week of vintage car fun. Hard to believe an event that started in 1950 with a road race through the forest of Pebble Beach and accompanying car show at The Lodge, has grown to a week of such magnitude. Some claim this is the most prestigious vintage car event(s) in North America and I unquestionably agree. This year I found some of the smaller events as rewarding as the week ending Concours. On Tuesday the Carmel-by-the-Sea Concours was held on Ocean Ave. This free to the public event drew more than 175 multi-marque entrants from the 1940’s to 1989. These classic machines were displayed on Ocean Ave and connecting side streets. I was extremely impressed with the quality of the cars and that a majority of the owners were very willing to talk about their classic cars. The volume of spectators was large, yet you could still take your time to admire the vehicles. This by far was the best free event of the week. 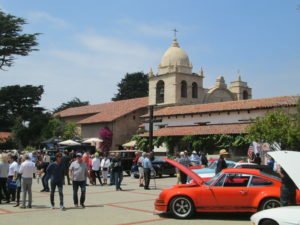 The Carmel Mission Classic is held in the courtyard of the historic 250 year old Carmel Mission. 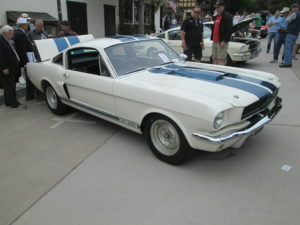 This Wednesday event featured 55 cars of all marques and 9 classic motorcycles. A modest fee was charged to enter which entitled all to craft beer sampling and wine tasting from several local wineries. The grandson of company founder E.L Cord, Chris Cord was there with his 1937 Cord 812. He was very approachable and offered great insights to the Cord Corporation. This was a very relaxed event in an interesting and unique venue. Attended by about 1,000 people, it never seemed crowded and displaying cars in the Mission courtyard provided a very unique setting. A jazz ensemble played adding to the enjoyment of the afternoon. Rest assured I will be attending in 2019. The early Thursday morning Pebble Beach Tour d’Elegance draws more spectators every year. Free to attend, this Tour features most of the 208 cars that will be displayed at Sunday’s Concours. This event allows all to see and hear the cars running. They gather on Portola Road in Pebble Beach and are placed into two groups. At 9 a.m. all depart and follow parts of the original 17 Mile Drive finishing at Ocean Ave in Carmel around noon. The cars are parked on Ocean Ave while the drivers have lunch. In the event of a Concours judging ‘tie’ the cars that completed the tour have the advantage. Large crowds are at the beginning and end of this event making picture taking challenging. However if you wish to see most of the cars that will be on the lawn at Sunday’s Concours, this is a must attend. 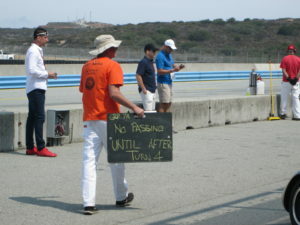 Friday and Saturday the place to be is the Laguna Seca Raceway for the Motorsports Reunion. This year the featured marque was Nissan. Datsun (now Nissan) has a rich racing heritage including actor/driver Paul Newman, BRE (Brock Race Enterprises) team owner and car designer Peter Brock and champion driver John Morton. In the mid 1960’s as Datsun fought for brand recognition and market share, they contracted with Peter Brock’s BRE Team to campaign the Datsun 2000. Success lead BRE to race the now famous 240Z and 510. They even race prepared a truck for the Baja 1000 race. This annual event attracts over 550 vintage performance cars raced in 15 ‘groups’ determined by engine displacement. The cars range from pre-1940 sports and touring machines through 1991 IMSA (International Motor Sports Association) race cars. Speeds exceed 120MPH for many of the participants. Laguna Seca Raceway is located over the mountains from Carmel in Salinas. The track celebrated its 60th year in 2017 and looks great! This event allows sectors full access to the paddock area with plenty of food and beverage options. A great way to spend a day or two. The crowning event of the week was Sunday when the 68th annual Pebble Beach Concours was held. 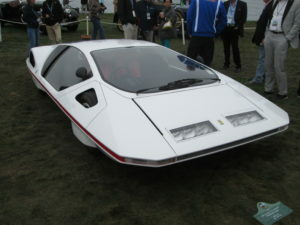 The cars are displayed on the Pebble Beach golf course in front of The Lodge. With the Monterey Bay as a backdrop, you would be hard to find a better place to display of some of the most exquisite cars in the world. This year’s marques were Citroen, Tucker and OSCA (Officine Specializzate Construzione Automobili). Founded by the Maserati brothers in 1947, the company had a reputation for building high-quality, fast race cars. 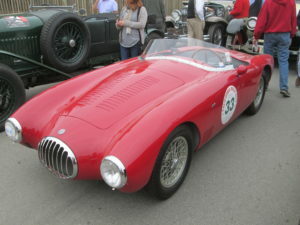 With OSCA winning European races, they were imported into the USA in 1952. With only 200 produced before production shut down in 1963, they remain one of the more successful race cars of their era. Launched at the Paris Auto Show in 1955, the Citroen DS 19 generated 12,000 orders the first day. The ‘advanced’ aerodynamics and front-wheel drive were revolutionary at the time. The company produced 1.4 million Citroens before production finally shut down in 1975. These cars were unique for the times and are also remembered for helping pull France out of the slumping post-war European economy. Tucker cars were made famous by the 1988 movie ‘Tucker: The man and his dreams.’ Manufactured in a former Dodge plant in Chicago, the Tucker 48 was also marketed as a futuristic car. Safety features such as pop-out windshields, padded under-dash crash chambers (no seat belts) and a centrally located headlight that followed the orientation of the steering wheel, the Tucker may have been too ahead of what Detroit was offering in the late 1940’s. Unfortunately, these selling features were not enough to secure the necessary capital to begin mass production. With only 51 Tuckers produced, the courts ordered the company to liquidate in 1949. With few assets, Preston Tucker died in 1956 at the age of 53. Monterey Week is truly a car lover’s dream. Even if you can only attend an event or two rest assured, it will be time very well spent. 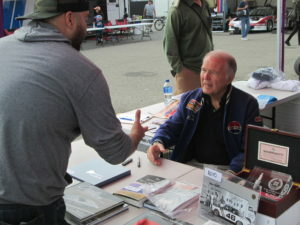 One of the joys of the classic car hobby is talking with car owners to learn ‘the story’ behind their machine. This is one of the joys I find in attending these events. You by no means have to be a car expert, just appreciate the time and effort that is contained in these beautiful vehicles.